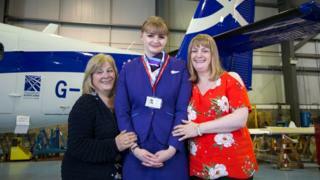 A teenager whose mother was the first baby born on a Loganair plane has become a member of the cabin crew. Chloe Stott, 18, is the daughter of Katy Stott, who was born 2,000ft above Orkney in 1973 on a special air ambulance flight from the island of Stronsay to Kirkwall. The aircraft was only a few minutes into the short flight when Katy's mother Freida Devin gave birth. Chloe said she has always wanted to be a cabin crew attendant. Thick fog prevented the aircraft from landing in Kirkwall, and Captain Jamie Bayley had to divert to Aberdeen. The baby was christened Katy Ferguson Leynair Devin, adopting the surname of the late doctor who helped, while inheriting Ley after Captain Bayley and nair from Loganair. Chloe, who has just moved from Orkney to Aberdeen, said: "I've wanted to be a cabin crew attendant for as long as I can remember. "It's probably linked to the unusual circumstances in which my mum was born but both of us share this interest. "My family is originally from Orkney, so it's wonderful to be working for an airline which holds such established roots with the islands and I'm looking forward to working on some of the services operating to Kirkwall." Mrs Devin, who now lives in Elgin, said: "It's not how I imagined I'd give birth to my third child. "I knew I was in capable hands, with everyone doing their best to keep me comfortable for the duration of the flight. "It was only afterwards that I found out Katy was the first baby to be born on an air ambulance, which is an interesting conversation starter. "I'm still grateful to everyone who was there to assist me on that summer night, over 40 years ago." Captain Bayley recalled: "You can imagine the noise and stress in the small Islander cabin leading up to this moment and the huge relief at the birth of a healthy baby. "We diverted to Aberdeen, which was especially opened for us, duly amended the flight plan to add another soul on board and we were greeted on arrival by police and ambulance." Loganair's managing director Jonathan Hinkles said: "We're delighted to welcome Chloe to our cabin crew team. We are proud to maintain the same emphasis on community service today as back then."